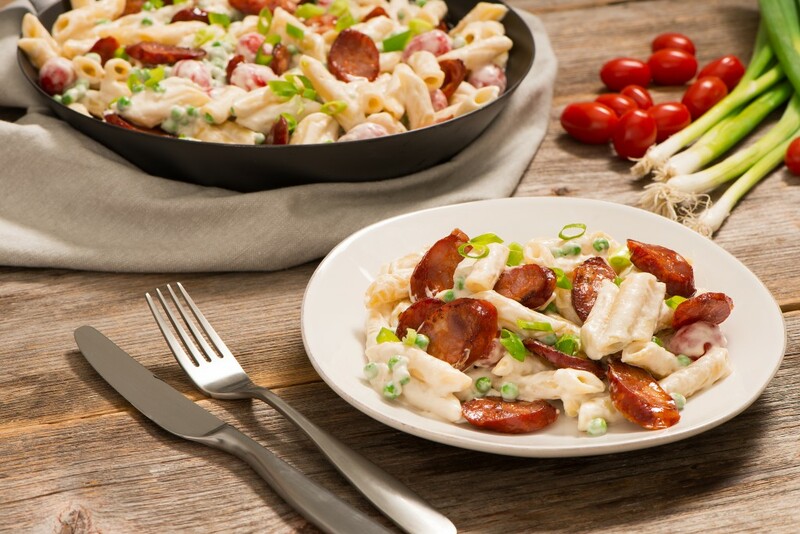 Bring home zesty Creole flavor with this creamy, flavorful pasta dish made with Carolina Pride smoked sausage. 1. Slice sausage in ¼-inch slices. 2. Heat a large skillet over medium-high heat. Brown sausage well. Remove from pan; set aside. 3. 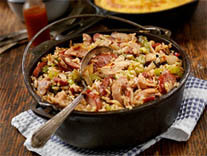 Return pan to heat and deglaze pan with the 1½ cups water. Add the pasta. Bring to a boil, cover and reduce heat. Cook until water is absorbed by pasta (about 8 minutes). 4. Add the cream, peas, Parmesan and Cajun seasoning to the pan; stir well. Add the browned sausage back to the pan; heat through. 5. Top with sliced green onion and grape tomatoes. Serve immediately. 6. Serves 2-4, depending on appetite and accompanying dishes.